Q: How could anyone invite Sanya as guest speaker? Q:Where does Sanya get invited to speak? A: Sanya is open to speak at various places. Usually she speaks at schools, conferences, churches, professional events as guest speaker or keynote speaker, businesses, and other non-profit/for-profit organizations. Sanya is able to speak to any number of professional crowd. Q: What does Sanya speak about? or typical topics? 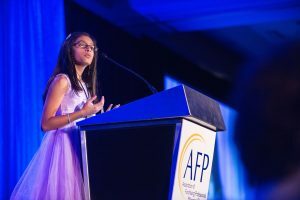 Sanya’s story about community service and youth involvement at Sanya’s Hope For Children to make a greater impact. How to initiate a service project. Q: How far in advance does Sanya need to be informed for a speaking engagement. A: As soon as possible. However, Sanya is open to consider it as short as a 15 day notice. Q: Is Sanya willing to travel? A: Yes, as long as she gets permission from school. Q: How much does Sanya charge for her speaking engagements? Q: Do you have any YouTube Videos of Sanya’s speaking engagements?